Your Pacific Harbors Council offers several different opportunities for Scouts and their families to experience summer camp in 2019! Please read below for more information. Camperships are available through grants for all who qualify and turn in their application on time. Click here for more information! ***Please note that Camperships are not available for the Summer Family Camp only. Cub Scout Resident Camp will bring you to the "High Seas" without leaving Camp Thunderbird! This is a camp you won't want to miss!! Make sure to check out the list of class offerings on the registration page! Summer Family Adventure is an event for all family members ages 3+! 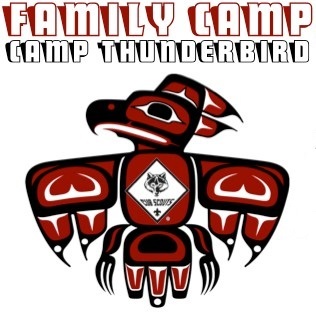 JULY 14-17, 2019 AT CAMP THUNDERBIRD! Summer camp is usually the highlight of the Scouting year. It can be particularly exciting for first year Scouts. It can also be a little intimidating whether it’s a Scout who just bridged over from Webelos or a young Scout who isn’t ready for a week-long camp session. So this year at Camp Thunderbird, we are offering a shortened summer camp session designed specifically for the youngest of Scouts (through 12 years old). Many summer camps offer special programs for first year Scouts. At Camp Thunderbird, the first year camper program is called Trailblazer. Pathfinder is another common name for this type of program. A typical first year program will offer the opportunity for Scouts to work on their early rank requirements. Many of the requirements for Tenderfoot, Second Class, and First Class lend themselves to the outdoor setting of summer camp. They can practice knots, build fires, and learn to use a hand ax. Your Scouts will get to work on a merit badge as well. Other activities include swimming, boating, and shooting sports. One of the biggest advantages of first year camper programs is not the rank advancement opportunities. It is that your new Scouts will be with their buddies and with other first-year Scouts. They learn basic outdoor skills with others who are at their same level. This will help them adjust to camp life and combat homesickness. The main goal, after all, is for these Scouts to have an excellent experience at summer camp so they want to stick with the Scout BSA program. Benefits for the parents and adults in your Troop are that this program is provisional. This means Camp Thunderbird provides the leadership and supervision. This is a great alternative for families who don’t have the ability to take the time off from work, wonder if the Scoutmaster can go, or need a less expensive option. And remember, adults are welcome! REGISTRATION INFORMATION for Trailblazers WILL BE AVAILABLE SOON! August 1st - 2nd, 2019 at Camp Thunderbird! Join us for a Trail to First Class Overnight Adventure tailored for our friends in the Church of Jesus Christ of Latter-day Saints!